The Saturday after Thanksgiving has become the date for a new tradition in North Carolina and surrounding states. Arriving on the show grounds by 8 AM, the main parking lots beside the main stage were already packed with gleaming Tri-Five Chevs, Corvettes, MOPAR, Mustanges, Camaros and VIP cars. Of the latter group, many current and retired NASCAR drivers bring their personal fun cars to display. Dale Earnhardt Jr., Rusty Wallace, Denny Hamlin, Ryan Newman and others have everything from 76 Chevy Laguna (Jr.) to 2018 custom Corvette Z06 (Rusty) to Ryan Newman’s tribute 1968 General Lee Charger. Dave Roberts had a 1967 Porsche 911S Lightweight at the show. This sat near Rick Hendrick’s personal 2015 Porsche 918 Spyder technical tour de force. Host Ray Evernham brought a couple of his personal cars on display. On the back of his 1948 GMC Car Hauler was a unique creation first exhibited at SEMA 2017 (and later at PRI). It’s a 1936 race car made by hand with old school techniques in his shop, Big Iron Garage. It is a fully adjustable and adaptable racer. On a trailer behind that was David Allison’s #17 1968 NASCAR Ford Torino, resplendent in its original blue and gold livery and sporting a Holman Moody 396 c.i. powerplant. The 1936 racer is called “Ghost” and it will be the subject of a future story in the newsletter. Ray is quite proud of the creation, which he plans to run at a broad spectrum of venues, from circle tracks, to drag strips, Bonneville, and even Pikes Peak at the hands of a recently retired popular NASCAR driver (wink!). If there is a “problem” with the show it is the breadth of the offerings, the large amount of geography to traverse and the large number of enthusiastic and knowledgeable owners to speak with. Such problems! This year it was mentioned that there was another record turnout of cars and spectators. There were more than 600 cars and an estimated 3000-4000 people. At the entrance gate they ran out of packets for the cars! The “overflow” lot of later arrivals had numerous jewels on display, so it was imperative to make the effort to see them. The list of Choice Award winners gives one impression of the diversity of offerings. In one parking lot across the road from the stage were more than 20 Corvettes, from the latest generation of C7s to 427-powered C2s. A couple monster wide-bodied C7s were nearby. The Queen City Corvettes Club won the award for most entries from a car club. A couple of cars that stood out and will be featured in the near future were a 1961 Ford Starliner with a rare 427 hemi built by Holman-Moody in 1971. Larry Hill has a great story for this immaculate sleeper. What a beast! It won the Ingersoll Rand Choice Award. Another amazing creation was a 1936 Ford Woody truck hand-built by owner Pat Crusse, complete with a matching wooden boat (Heart-n-Soul) on trailer! Another fascinating story and the winner of the NASCAR Choice Award. It is impossible to convey the atmosphere of an event but the enthusiastic and friendly spectators had much to enjoy, as the day warmed into the 50s. 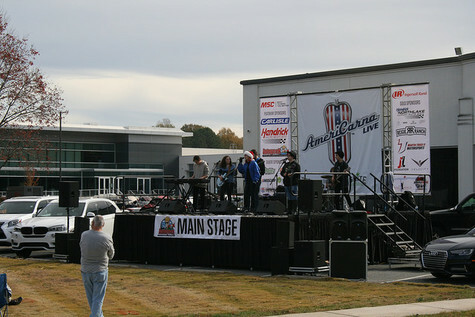 On the main stage there was live music and Ray had several celebrities speak and answer questions. Speaking with Ray Evernham after the event, he was visibly moved and he said it is not easy to express the appreciation so many people have for the attendees and volunteers, as all proceeds support the IGNITE program that has programs for young adults with high-functioning Autism or Asperger’s Syndrome. Many corporate supported of IGNITE and AmeriCarna presented checks to Ray on stage, including Ingersoll Rand and MSC ($15,000 each). Other major sponsors included Carlisle Companies, Hendrisk Motorsports, and Autogeek. In closing, the AmeriCarna Spirit Award was presented to Ron Pratte, famous businessman, car collector and philanthropist. Fox Sports announcer and auction block expert Mike Joy got on stage with Ray and told the story of how Ron donated his personal liquid blue 2017 Ford GT to the Evernham Family- Racing for a Reason Foundation. The GT will be auctioned by Barrett-Jackson during the Scottsdale AZ event January 13-21, 2018! Proceeds will benefit the IGNITE program and allow it to have some security and perhaps allow expansion. It should be noted that Ford has contracts forbidding sale of any GT for at least 24 months. Ford has worked closely with the Autism Alliance of Michigan and they made a special exception that allowed Mr Pratte to generously donate his car for auction. This was a very fitting end to another classy and well-done AmeriCarna Live car show.